Yunnan Government removed 15 counties from impoverished list on September 29, and Xiangyun in west Yunnan’s Dali is one of the counties. In the past three years, Xiangyun County has made 84 companies participate in poverty alleviation, with their aid benefiting 136 villages in the county. 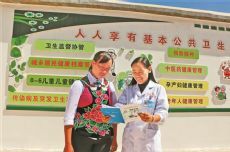 52 Xiangyun businesses were recognized as models in employing locals for the purpose of poverty relief, while 32 companies set up poverty alleviation offices and established a long-term assistance mechanism. More than 2,000 job opportunities, together with 3,000 seasonal jobs, were constantly offered to local poverty-stricken folks in the past years. The practice helped lift over 20,000 impoverished villagers out of poverty. The Shenglong company exported local produces to 17 countries and regions such as Japan, South Korea, America and Europe, earning an annual revenue of 20 million US dollars. Liu Wenwu, the company head, said the company’s technology enhanced productivity in the agricultural sector. Nowadays, the yearly output value from each hectare of vegetable field can reach around 400,000 yuan. “My household planted 0.66 hectare of prickly ash trees that brought me an income of 10,000 yuan this year," said Chen Guanghua, whose family used to be stricken by poverty. In the past three years, the county has invested 280 million yuan in agriculture, of which 98 million was dedicated to poverty alleviation. Around 6,600 hectares of deserted fields were reclaimed for planting economical plants, and guided by poverty-relief workers local villagers raised 300,000 pigs, goats, chickens and others.